Barrier to sale: A spare room in this Edina home was being used as an office. But the room was disorganized and the furniture layout awkward, and the bland vanilla walls did little to enhance the newer wood floors, large windows, painted wood shutters and new wall sconces. After staging: "We needed to show buyers what an ideal bonus room this was," said Lori Matzke of Centerstagehome.com. "Buyers want to see organized, well-presented space. They don�t want to see rooms that look a little too lived in." 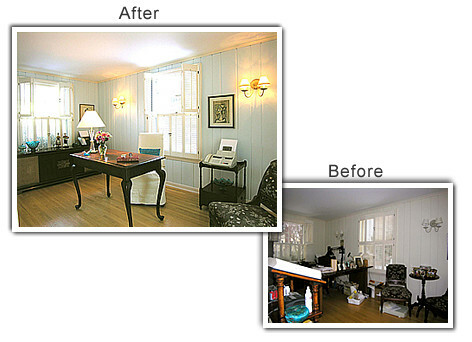 Removed excess supplies and furniture, including a file cabinet and a vintage lectern that was blocking a doorway. "As a seller, you always want to put yourself in the buyer's position from the entry point of the room," Matzke said. "And you immediately want them to be thinking about the room's great features, not wondering how they're going to maneuver around the clutter." Painted the walls a pale glass-blue that has an up-to-date feel but is soft enough that it won't offend potential buyers. "There needed to be enough color on the walls to show a distinction between the floors, shutters and sconces," she said. Replaced a large, clunky desk with a smaller mahogany table that makes the room feel more spacious and creates a visual distinction between the furnishings and the floor. She put the table toward the middle of the room to make better use of the long, narrow space and to draw the eye through the room. Rather than using a utilitarian office chair, covered an extra Parsons chair from the dining room in a silky textured champagne slipcover she bought on clearance for $5. An $8.99 pillow adds color, too. Put the fax machine on a mahogany side table borrowed from the living room and taped the cords to the leg. A display table and chair were put in storage. Placing the credenza under the window gives the room balance. Installed sconce shades covered in a soft, silky fabric with a band of decorative fringe around the base to draw attention to the fixtures. With no overhead lighting, she replaced the clip-on task lamp with an acrylic table lamp and soft shade to give the space more style and light. Opened the top shutters to bring in more light, added colored accents and fresh flowers to draw the eye around the room, and hung original artwork to pull the new color scheme together.